Artist Sarah Goodridge’s Self-Portrait at the Museum of Fine Arts in Boston was simply part of some routine research. But it gave me pause. Was this the pose and attitude of an antebellum spinster? Not like any I had seen before. Sarah Goodridge, born in 1788, studied with Gilbert Stuart. He considered her portrait of him to be his most accurate representation. Goodridge adapted Stuart’s techniques of oil on canvas to watercolor on ivory so skillfully that her paintings possess more depth and sophistication than many other miniatures of the time. The small painting brought to mind one of the most audacious — and sensual — of American antebellum portrait miniatures, Beauty Revealed, at the Metropolitan Museum of Art. 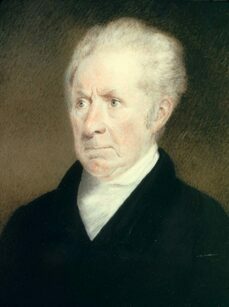 Goodridge traveled from Boston to the District of Columbia in 1828 to deliver this other self-portrait to Daniel Webster (1782-1852). A quarter century of letters between the two provides no written documentation of their relationship. But, the miniature gives artistic documentation in the gentle folds of fabric entwining her “gift” to Webster and in its deep red frame with soft interior lining. When Goodridge gave Beauty Revealed to Webster, he was a widower. His wife of 20 years, Grace Fletcher, had died earlier that year. In 1829, Webster married Caroline LeRoy (1797-1882), a woman younger and wealthier than the artist. 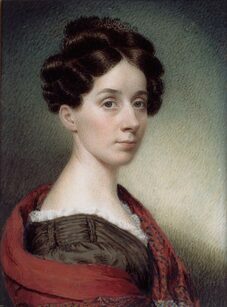 Goodridge painted her self-portrait in 1830. What does her expression reveal? Goodridge painted more than 160 known miniatures. The detailed work took a toll on her eyesight. She was blind by 1851 and dead by 1853. She never married. At the current time, when a major focus of art interpretation is objectification of women and people of color, in her own age, this exquisite artist was the subject of her life and work. Carrie Rebora Barratt, Gilbert Stuart, Ellen Gross Miles, Gilbert Stuart, Metropolitan Museum of Art, 2004, 291. Carrie Rebora Barratt, Lori Zaba, American Portrait Miniatures in the Metropolitan Museum of Art, Metropolitan Museum of Art, 2010, 125. Dale T. Johnson, American Portrait Miniatures in the Manney Collection, Metropolitan Museum of Art, 1990, 126-127. This entry was posted in 19th Century American Portrait Artists and tagged 19th century American portrait, Beauty Revealed, Daniel Webster, Sarah Goodridge. Bookmark the permalink.